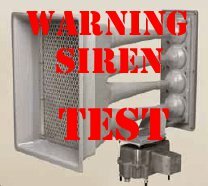 The outdoor emergency warning sirens in Nelsonville and The Plains will be tested at 12 noon on Wednesday, July 3, 2013, with a one minute sounding of the sirens. This time change is so Athens County can participate in the statewide tornado drill. Local residents are asked not to call local emergency agencies inquiring why the sirens are sounding. a) When the National Weather Service initiates a Tornado Warning for an area that includes areas of Athens County. b) When the National Weather Service initiates a Severe Thunderstorm Warning (winds 58+ mph, large hail, severe lightening and heavy rains), for an area that includes areas of Athens County. 2) When there is an actual enemy or terrorist attack against the United States has been detected and is threatening areas of Athens County and protective action should be taken immediately. 3) When a public safety emergency occurs the sirens will be used to alert the public of emergencies such as hazardous materials incidents and civil disturbances. The Athens County SIRENS DO NOT identify specific types of storms or emergencies, therefore you should immediately seek shelter and tune to local television or radio for further information. This entry was posted in Uncategorized and tagged June 2013. Bookmark the permalink.